Thank you one and all who contributed to the MUCH Christmas Fundraiser. Contributions came from those who receive our newsletters, Facebook friends, and new friends of friends. Thanks to all of you! Our monthly contributions throughout 2019 and the Christmas Fundraiser will carry our programs through the year. Here is our program for 2019. Massage Therapy in four cities and two villages. We have a total of eleven massage therapists serving a minimum of forty-four children per month. Meet all of our massage therapists here on our website. Our Transportation Scholarship Program sponsors four University students through the Evangelical Baptist Church in Chornomorsk. One was not able to meet with us because of illness. Sveta, our manager Ira, and I met with the Pastor. He expressed great thanks for our sponsorship. He shared about how the students use their education to do ministry in the church with the children and the youth. They are giving back to the community even before they finish their education. Our Clothing Program provides underwear and indoor slippers for the children at the Transition Home in Marganets. It is our smallest program, but the connection with the children and their need for clothing paved the way for massage therapy. Three years ago we started massage therapy at the Transition Home, which proved to meet a much greater need. Their lives have been changing for the better. 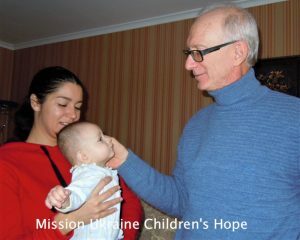 This month, Mark and I had a wonderful meeting with 9 month old Luba and her mother. We saw how much hope Luba’s mother has about restoring her baby, despite the new diagnosis that the doctors have set. An internal hemangioma has formed on the neck of the child, which has greatly increased in the last month to the size of a walnut. Next week the child will be examined. Doctors suggest that it is impossible to remove the hemangioma because the artery passes through this formation and also during the operation it can affect the facial nerve. The good news is that the she no longer has several cystic formations in her head. Luba also learned to roll over to the left side. Previously, it was hard for her to do this because the left side of her body does not function as well as the right. She still cannot pick up toy with her left hand, but this baby found a way out of this situation; she learned to shift the toy from her right hand to her left. Luba’s mom has a big faith and positive words about her child. She allows no doubt to creep into her heart. When people say that her baby is premature, she answers that her baby was in a hurry to come to this world. When people say that her baby is very small, her answer is that the little feet can do a great job. We also met with Ilya. Once the doctors said that this child was hopeless and unpromising. But Dr. Natalya has been working with the boy for eight years already. Massage therapy and exercise are developing skills in walking, squats, etc. Ilya continues with a great desire to learn how to walk with one cane or holding onto a wall. The child told us that his greatest desire is to walk on his own. Ilya persistently follows all instructions of the exercise therapist. After massage therapy, Ilya has a one hour exercise program of balance, climbing steps, sitting and standing, and walking skills. Earlier, Ilya could focus only on walking. If someone spoke to him, he would try to answer and lose focus and fall. Now the boy can talk in the process of learning to walk. He asked us many questions and at the same time moved forward with rearranging his canes. His speech has become clearer and he is more sociable. Illya no longer has a fear of falling, and if this happens he rises and goes on. Keep it up, Ilya! Mark and I had a wonderful opportunity to lay hands on children and pray for them. We believe that every child is in God’s hands. Your and our part to love children and help everyone with the gift each of us has from the Lord. Thank you for your prayers and finances for providing children with their needs. This entry was posted in Uncategorized on January 30, 2019 by Sveta Koehler.